The principal economic activity of Galapagos is tourism, which started in the 1970s when the first island dwellers used their own fishing boats to take round visitors. 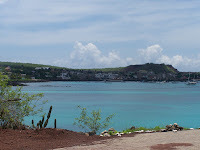 Since then the number of visitors has increased and during 2005, the Galapagos National Park reported that 122,000 visitors had been to the archipelago. However, this sustainable form of tourism may be changing. Discovery World Cruises will sail into San Cristobal in April 2006 with a 500 passenger ship. Ecuadorian environmentalist, Deborah Chiriboga, said: "The future of the islands is uncertain. We are allowing Galapagos to lose its natural value. The tourist sector has shown that it is not interested in conservation. They are mainly responsible for the uncontrolled immigration into the islands." Guide, Witman Cox, thinks that the Galapagos National Park should ensure that tourism includes local participation. In other words, that tourists should not just visit the uninhabited islands but should stay in the Galapagos towns to consume local services. The Minister of the Environment, Ana Albán, confirmed that her vision of Galapagos tourism is to attract affluent visitors who are interested in the wildlife. "The first step is to talk to the islanders to see what type of activities will take place. For the first time we are working with the Ministry of Tourism to design a long term plan with international support." The Special Law for Galapagos establishes that tourism should be participative and that the benefits should be distributed across the board. The authorities are not completely responsible for the management of tourism but if there is a lack of attention to this, the municipally will take control. One of the examples is sport fishing which, although it is allowed, there are no regulations. We are not going to wait 6 years more when there is already a growing demand for this type of activity that has little impact and benefits the islanders. In future tourism should not be mass tourism but selective. I have had various meetings with the members of parliament for Galapagos so that Congress can decide as to whether to increase the tax paid by the tourists when they enter the islands. At the moment they pay $100. We need to have more tourists in Galapagos but the model of tourism should include local participation. The local people should receive, directly or indirectly, the resources left by the visitors. We have the advantage that we are only starting with tourism so we are not repeating the errors made on other islands where the benefits did not remain in the islands. For this reason we have created regulations to control tourism and that guarantee that the islanders of Isabela will benefit. There is a limit on hotels so that they cannot be more than 450 square metres and limits on foreign investment of 50% (the remaining 50% to be from a local partner). We also ask that tour operators be accredited by the Municipality of Isabela. Tortoise bulletThe Galapagos Conservation Trust (GCT) works to contribute to the successful management of the Galapagos ecosystem. 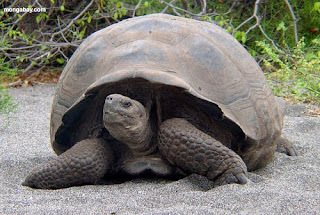 Tortoise bulletThe GCT also raises awareness of, and funds for, the conservation needs of Galapagos. Tortoise bulletThe GCT is the primary source of information and comment in the UK on conservation in the Galapagos Islands.